It is the primary aim of The Australian Justice Tribunal (The AJT) to ensure that not one Australian is ever denied the right to natural justice. And as earlier stated on our 'Denial of Justice' page, it is estimated by The Australian Institute that 1.7 million Australians require legal assistance each year, of which 500,000 (approx.) are in need of pro bono support. But only 300,000 of these financially distressed Australians can be accommodated by responsible Law Firms, Legal Aid and charitable organisations such as The AJT; leaving around 200,000 to be denied justice annually. In time, our Licensing program will see Law Firms, Accounting Practices, and selected businesses acting as Licensees of The AJT throughout Australia. And the roles of each AJT Licensee will eventually combine to satisfy the floating 200,000 distressed Australians who are constantly in need of pro bono legal representation. The Objective of The AJT is to grant each of Australia's 8,000 Law Firms a Licence to use its Intellectual Property primarily for the purpose of raising 100% tax deductible funds from their high net worth clients (and others). 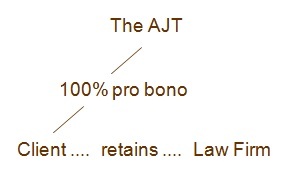 By acting as a Licensee of The AJT a Law Firm has the right to bank all donations into a dedicated AJT bank account which is controlled solely by that Firm on the conditions that the donated moneys are receipted "for the purposes of the Australian Justice Tribunal" and applied exclusively to the cost of funding pro bono legal representation for its financially distressed clients. Note that it is item (c) above that categorises the Law Firm as a 3rd Party Funder by assuming the role of The AJT as its Licensee. With the licensing of Australia's 12,000 Accounting Practices as Licensees of The AJT, it is these Accounting Practices that also become 3rd Party Funders. For example, each licensed Practice acts as a Licensee of The AJT and therefore has the right to offer its high net worth clients (and others) the opportunity to donate 100% tax deductible moneys into the Licensee's dedicated AJT bank account. These donations are also receipted "for the purposes of The Australian Justice Tribunal" and must be used exclusively to fund the cost of introducing and maintaining the legal representation to be retained by the Licensee's financially distressed clients who are in urgent need of pro bono legal services. Selected businesses around Australia are also being offered Licences to act as Licensees of The AJT. However, their roles are exclusively confined to fundraising and the possible nominating of recipients for pro bono legal assistance. The majority of cases handled by The AJT required the assistance of independent Law Firms who were prepared to offer our clients pro bono or contingency based fee structures. And many cases required us to pay normal fees for the legal representation required. But whatever the representation, pro bono, contingency based or in accordance with a conventional fee structure, our services to the client remained pro bono. How we negotiated with such Law Firms and how their fees (if any) were paid was up to us. And in cases where Law Firms wished to be paid full fees, then that was where 3rd Party Donors became essential. At this stage the client's case has been accepted by The AJT and a Law Firm has been appointed on a full fee basis. Note that it is the client who retains the Law Firm and not The AJT. A 3rd Party Donor has been found. This Donor will place funds directly (bypassing The AJT) into the Law Firm's trust account as and when required to cover the associated legal fees. But note that The AJT will remain in an overseeing capacity and will be kept apprised of all developments by the client, Law Firm and 3rd Party Donor.